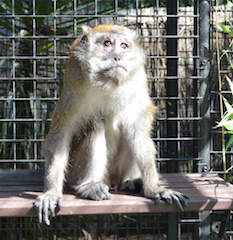 We provide a tranquil loving home for aged and special needs primates, for the term of their natural life. We are a strictly no breeding facility, truely believing that these charismatic intelligent animals deserve to live their lives in the habitats that nature originally provided them. 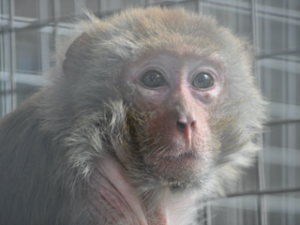 All of our primates have been born in captivity and spent their lives in captivity and cannot be rehoused in the habitats of their species origin. We focus on each monkey as an individual, not as part of a collection, in the sincere endeavour to provide the ultimate for each of them for the rest of their life. Our keeper escorted and catered tours ensure all income is generated from human labour, not just from the display of animals and all income is reinvested in the ongoing upkeep and provision for the monkeys. Born on 9/9/1994 and transferred to us in 1995 Mandy is not our oldest resident but our longest resident, and Mandy flaunts – it reigning supreme over all. Born on the 13/9/1999, he is one big strong boy weighing in at 18 kilos. 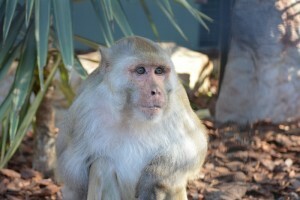 The average weight for a male Rhesus macaque is between 8 – 12 kilos. Mambo has the sweetest nature and will absolutely sulk if his food puzzles are too difficult and he can’t demolish them quickly. Kayron came to us from a private owner in February 2000. 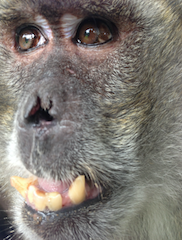 He is a very co-operative happy monkey and we believe he is about 28 years old. Gemma was born on the 12/12/1983 and was part of a collection held by at that time a long retired circus family. Gemma came to us in November 2007. 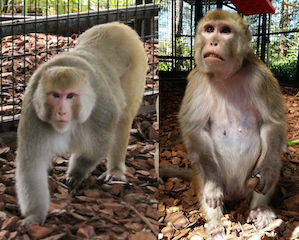 Gemma is most unusual in appearance for a Rhesus macaque being very small and “deformed looking’, but don’t let that fool you. Gemma is a feisty and determined little lady who is always poking her nose into everyone else’s business. 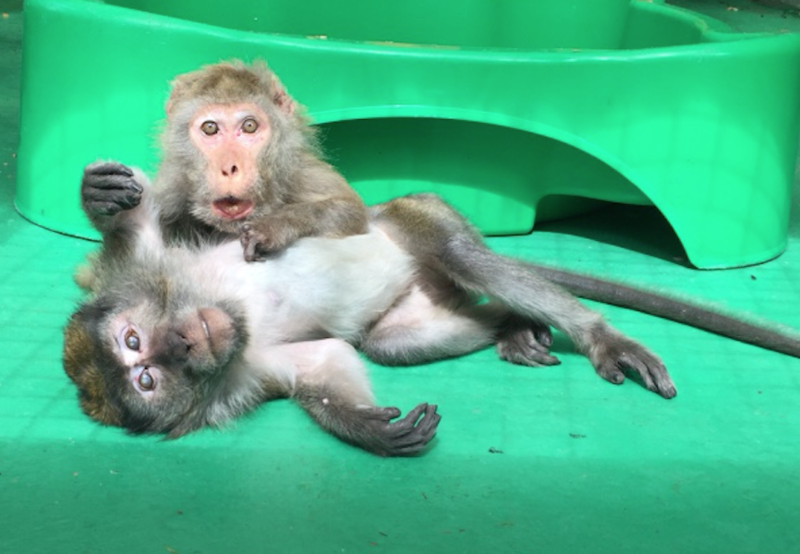 Despite her size Gemma has always gotten her own way and during her time with us has been successfully housed with several other macaques of different species. 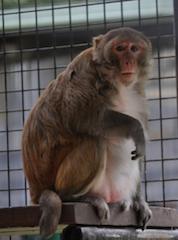 Gemma has been living with Tag, 25 years old Crab eating Macaque since March 2011. 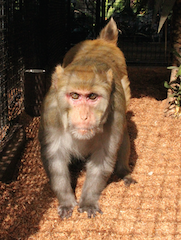 Tag came to us as surplus to the breeding program, from a regional zoo, in February 2011. Unfortunately, we noticed Tag’s eyesight deteriorating in December 2013. Our veterinarian diagnosed him with Diabetes and as a result of this, his eye sight was impaired. Now almost totally blind Tag is a sweet and trusting natured boy. Gemma is his constant companion guiding him up and down our connecting primate raceways and of course trying to involve him in everyone else’s business. Wally arrived in February 2000 and is believed to be about 30 years of age. His absolute favourite food is tomatoes and he goes to great lengths and gets into a lot of trouble when trying (and usually succeeding) to steal everybody else’s. He thinks he is king of the castle! Basil is a famous, well travelled former circus monkey. He was transferred into private hands in 1996 and came to us in March 2014. Many people who remember Basil from his circus days provide funny anecdotes about his unique character. 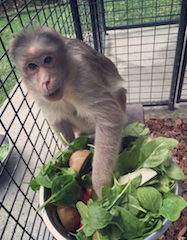 We try to let Basil be a normal monkey, but we too cannot help but smile when he gets up to some of the amazing things he does. Suzy is believed to have been born in 1994 and was part of a collection held in a small regional zoo that closed down in 1996. 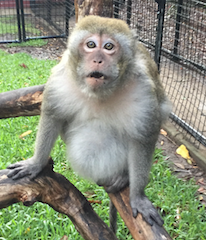 Suzy was then transferred to a loving private owner who passed away in March 2014. 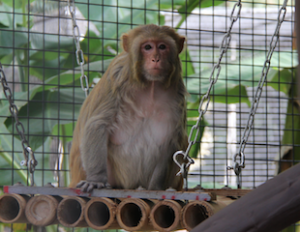 That is when she came to us – Suzy is a quiet and devoted companion to her cage mate, Basil. Bingo and BB are best buddies who are both close to 40 years of age. 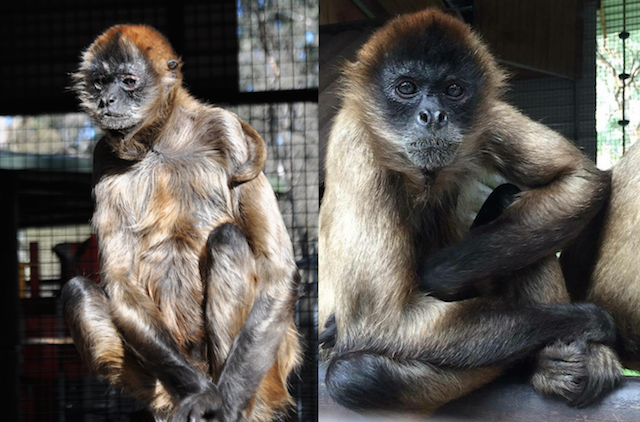 Originally from a major zoo then transferred on to two other facilities. 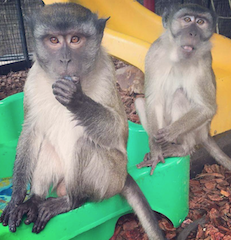 It was a long journey for them before they arrived here, their forever home in February 1997. BB has a nickname by his keepers known as ‘Bugger Boy’, he is always up to something while Bingo is nice and chilled out observing what is happening. 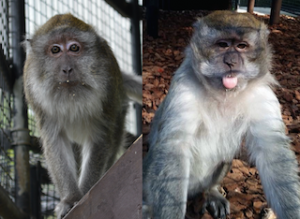 These 3 mischiefs are known as the ‘family’ of our sanctuary. Brittany is 11 years old and came to us with her mate Jerry Senior along with their infant Micky in March 2014. 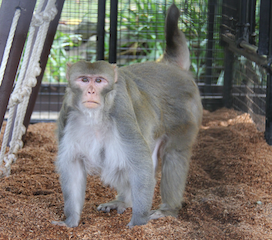 Jerry Senior is 40 years old and is in remarkably good health, as the average lifespan for a Rhesus Macaque in captivity is 30 years. 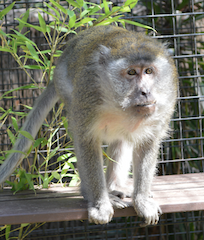 Jerry has a wonderful disposition and is extremely patient with little Micky, who is 3 years of age. Micky’s favourite pastime is to use his dad as a trampoline when Jerry is trying to have a nice peaceful nap in the sun. Tom and Jerry are twins, born 24/10/1997. Tom is forever on the go and loves to meet and greet everyone with a big lip smacking kiss. Jerry pretends to be a quiet and chilled out boy, but its only a ploy. He sits quietly in the background eating his tucker and treats while Tom is bouncing around causing all sorts of mischief. Two brothers both born in 2010 and surplus to the entertainment industry. 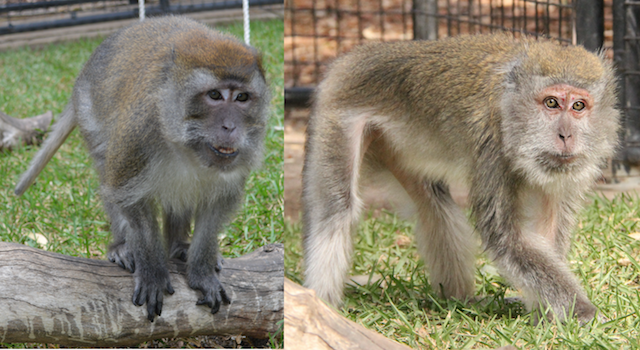 They were transferred to us in February 2012. Now at 6 years of age they are reaching sexual maturity and are affectionately referred to by their keepers are our ‘Brats’. Forever on the go and requiring lots AND LOTS of enrichment and stimulating pastimes to occupy them – it is a constant battle for their keepers to outwit them. Brenty and Benny win every time. Acquired in July 2010, Barbie is a very caring and loving companion for Rani. Always putting up with her nonsense, Barbie will be very indulgent when it comes to protecting and caring for her companion. Rani is one of our naughtiest and loudest residents who is always up to mischief. 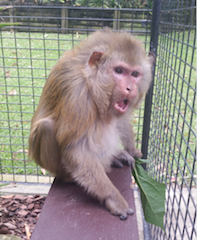 She will scream with excitement when she sees her food, enrichment and browse coming her way. Arrived here in August 2000 from a theme park that closed down. Agro was part of a performing troupe of 6. His name might be ‘Agro” but his temperament certainly isn’t. 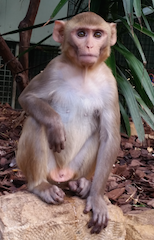 He is a complete diplomat who has outlived his original cage mates and always manages to fit in with everyone else. Ziggy arrived in June 2015 after a lifetime career in the entertainment industry. Ziggy was quite lonely at first as we could not integrate him into another group, but then 2 months later along came Millie. As is true with all romances, it was love at first sight. They are living happily ever after. At 42 years of age Minnie is an extremely long lived lady. 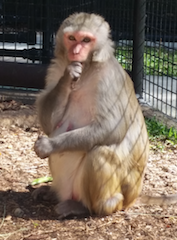 She was originally housed at a major zoo, then transferred to a regional zoo, then again to a small private zoo. When that zoo closed down in 1996, Minnie came to us. Along with Jabba Jaws and Ernie. 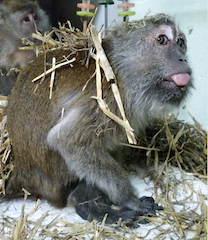 Now very frail but still active and eating well Minnie is everyones favourite monkey. Jabba and Ernie are both a couple of years younger than Minnie. Jabba is the big boss and Ernie is his faithful 2IC. They are both very sprightly for their age – but these days laying around in the sun waiting for room service seems to be their preferred pastime. Missy and Boofy arrived here in March 2014. Both estimated to be about 24 years of age. Their history is not fully known, other than they were transferred approximately 10 years ago from a regional fauna park into private hands. 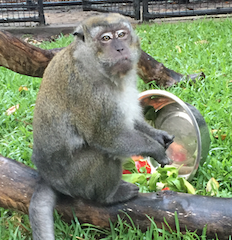 Missy is a withdrawn and quiet monkey, but distance observations by keepers when Missy thinks they are not around shows she is an active engaged little monkey enjoying all the enrichment and food puzzles offered to her and venturing up the raceways . Boofy is boisterous and outgoing always looking out for his little lady. Tammy was born in 1987 and what a career she has had! Before arriving here in October 2011, Tammy starred in a couple of television series, appeared in numerous ads and even walked down the red carpet. Although she still likes the limelight, always wanting to be the centre of attention especially around the boys, we hope Tammy prefers it here. Our private and exclusive Cabana and Eco Lodge accommodation is nestled in the gardens surrounding a surprising and beautiful primate park.